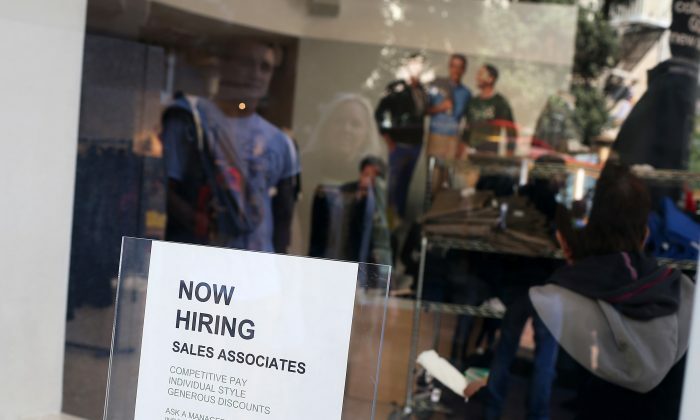 The U.S. gained 215,000 jobs last month, while the unemployment rate rose to 5 percent, the Labor Department said on April 1. Most of the added jobs were from construction, and the retail and healthcare industries. The Labor Department said the unemployment rate rose by 0.1 percent. “We don’t consider it a significant change,” said Bruce Bergman, an economist for the U.S. Bureau of Labor Statistics. The increase in unemployment may be good news, since more Americans came off the sidelines to look for jobs, although not all were lucky. That is the fifth time in the past six months that the number of people working or looking for employment has increased, compared to last year when the figure slumped to a four-decade low. The increase in the work force “has been truly astounding—the strongest in over two decades—suggesting that the job market is finally pulling discouraged workers off the sidelines,” said James Marple, an economist at TD Economics. The recent numbers suggest that employers remain confident enough in their businesses to add staff, even though overall growth has slowed since last winter. The ongoing hirings show that employers may believe the slowdown is not permanent. Although some believe that the continuous job gains are also contributing to higher wages, Bergman said there was a significant change in rate earnings between February and March, but it is not a strong change when you look at last year’s changes. “We have not seen the wage inflation that some people are saying will happen with the strong jobs report,” said Bergman. The average hourly pay rose 2.3 percent from last year to $25.43, however the annual wage increases are below a 2.6 percent peak that was reached in December, 2015. Although some states are looking to increase the minimum wage, slow wage increases have been a frustration for employees since the 2009 recession, especially since retailers have been heavily hiring low-wage employees. In a strong economy, pay usually grows at a 3.5 percent pace. This year also saw 150,000 fewer discouraged workers—those who are able to work but are not actively looking for jobs. The number of discouraged workers was over 700,000 a year ago. Retailers have contributed to the March job gains by adding 47,700 jobs. According to the Bureau of Labor Statistics, retail occupations were the highest employment in 2015. Construction companies added 37,000, probably due to warmer weather, and hotels and restaurants gained 26,000 jobs in March. Meanwhile, manufacturing reported another month of job losses. Mining, including the oil and gas drilling sectors have also decreased in hiring numbers.